Earlier this month we celebrated not one, but TWO birthdays in our house. Cute turned six at the end of last month, and Baby Cute turned one! How are they getting so big?!? I feel like B.C. was born yesterday! Since their birthdays are only a week apart I decided to host a small combined birthday party for our close family. Cute really wanted to have a Star Wars themed party for the two of them, but I just couldn't wrap my mind around that for a one year old. So I came up with the next best thing - donuts! We planned a "Donut You Know It's Our Birthday" themed party, and let me tell you - easiest party to host ever! Considering this was also my theme for most of my pregnancy with B.C. it was totally fitting. The party decor and food was super easy. So much so that I might recycle this idea for future parties or for hosting slumber parties. For food I simply placed an order with Dunkin' Donuts for a variety of donuts and donut holes. Just before the party I sent Mr. Cute on sole task for the party - picking up the donuts. And with that food was done. Done. No cooking, baking, or any kitchen clean up what so ever. Done. And it was ah-mazing. I did put my culinary skills to use by masterfully creating donut kabobs out of donut holes with lollipop sticks. It was a super brutal recipe, but I somehow managed to pull it off flawlessly. ;) All kidding aside, the kids absolutely loved these! For drinks I kept everything super simple. Everybody loves Dunkin' coffee so I just ordered a large box of that and set up a coffee bar for all of the adults. I kept everything well organized with some crystal serving pieces I had on hand and our favorite multipurpose southern glassware. 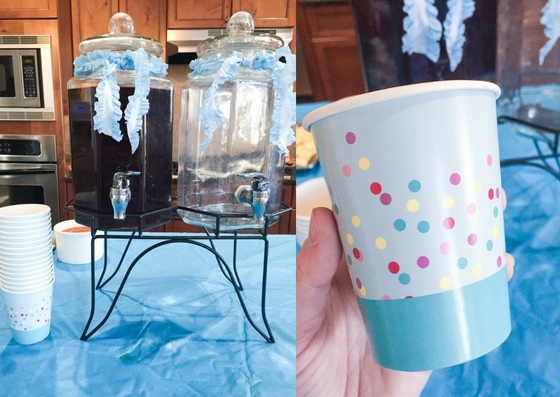 For children and non-coffee drinkers I set up sweet tea and water in my double beverage dispenser. 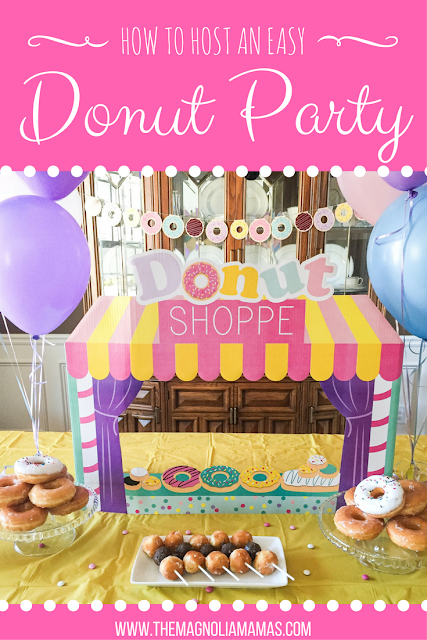 I also found the most adorable donut themed party decor. From confetti cups to sprinkled napkins and plates to cute party hats, I was able to inexpensively and easily round out my theme. I failed to take pictures of all the little details, but one of my favorite things was the Donut Shoppe Photo Cardboard that I set up as my centerpiece. I put my Polaroid camera out and let everyone pose for pictures that wanted to leave one with a message for the birthday boy and girl. It was super fun, and the kids have enjoyed playing pretend with it post party. It is super sturdy, and will be great to use for future parties as well. Carrie Beth and her crew swung by post party after some errands, and I was able to take this quick snap of our middle girls. I was also able to hand off a large amount of leftover donuts and drastically limit the intake of sugar LC was inhaling at a rapid pace. Those donut kabobs were her jam. Another one of my favorite party details was the attire. In year's past I had always ordered special coordinating party outfits or shirts, but this year I decided to go low key. I found adorable themed pajamas for all of the kids and let them be cozy and cute for all the party fun. B.C. looked absolutely adorable in her donut pjs! They also made for a super easy clean up post smash cake (a sprinkled donut themed one that I failed to get a close up of - yikes!). L. C. rocked her "I Love Donut" pjs, and told us she was never taking them off, but Cute's didn't show up in time even though I ordered way in advance. Luckily it bothered him none as long as presents were involved. The party was so much fun, and so so easy to put together. I loved that I was able to stress less, enjoy the day more, and really soak in that my babies are one year older. And when this made me a little teary I was able to eat my emotions with all of the left overs. Best. Party. Theme. Ever. Very cute!! Now I want a donut! Also can't believe she's 1 already!